He is the Lord in Brahmapuram, seated on the bull, wearing ring in one ear, sporting the pure white crescent on his head, with ash smeared all over the body, who has blessed Brahma who prayed to Him at the time of deluge and who has stolen my heart as well. This song on Lord Siva in Sirkazhi, Brahmapuram being its other name, forms the first song of “Panniru thirumurai”, a compendium of holy hymns of Saivam running into twelve volumes, and was sung by a three year old toddler, in response to his father’s question. It also marked the start of a torrent of hymns on Lord Siva to pour from this toddler thereafter . That child prodigy is Tirugnanasambandar, who blossomed into a Jnani ananya bhaktha after an incident that gave birth to this song. We shall see that incident along with a few highlights of his short life of sixteen years. Sambandar was born in a devout Saivite family in Sirkazhi. One day when he was a child of three, as his father Sivapadahrudayar was starting for the temple, little Sambandar wanted to accompany his father. As Sambandar was adamant, his father reluctantly took him to the temple. There leaving Sambandar on the bank of the temple tank, he got into the tank to have his usual dip. As he held his head under water taking a deep dip, Sambandar not seeing his father’s head above water, cried “Amma, Appa” in anguish. His cry touched the heart of Parvathi Devi who was on the celestial rounds with Her Lord and she came down and consoled him giving her breast milk drawn into a gold cup. Drinking the milk he became not only calm and happy but also imbibed Jnanam both para and apara. It is this transformed child with a smile on the lips that had traces of milk that Sivapadahrudayar saw when he came out of the tank. Assuming that Sambandar had taken milk given by a stranger and feeling angry, Sivapadahrudayar questioned him who gave the milk, threatening to punish him with a raised stick. It is then the child raised its tender finger and pointing at the temple tower sang the song we saw earlier. As father stared at the child in wonder with the stick slipping from his hand, child Sambandar ran into the temple and standing before the shrine sang ten hymns in praise of the Lord much to the amazement of people in the temple. Sivapadahrudayar guessed his son has been divinely blessed and calling him Jnanasambandar, now carried him home on his shoulders. The next day morning riding on his father’s shoulders Sambander went to the neighbouring temple at Tiruvalakka. There as he started singing a pathigam, i.e. ten hymns, clapping his tender hands to the rhythm of the hymn, there descended in his hands golden cymbals inscribed with Panchatchara. Touching them with his eyes and thanking the Lord, he completed the pathigam. When he returned to Sirkazhi a number of devotees from nearby places started coming to his place to see him, hear him and even to request him to bless their places with his visit. One who came to see him during this time was TiruNeelakanta Yazhppanar who was an expert player of Yazh. He wanted to accompany Sambandar in his travels, playing Yazh, to his songs. After hearing his soul-filling performance, Sambandar agreed and from then on he was part of Sambandar’s entourage. In the course of his travels, riding on father’s shoulders, Sambandar visited Chidambaram, and wanted to go from there to ThiruArathurai. This time instead of riding on father’s shoulders, he chose to walk. Feeling tired he halted midway at Maranpadi. That night Lord appeared in the dream of temple priests at ThiruArathrai and said that Jnanasambandan who is coming to Him be honoured with pearl palanquin, pearl umbrella and pearl symbols to sound in his procession. When they opened the temple in the morning they found these three in Lord’s shrine and they took them in procession to Maranpadi. As Lord had appeared and conveyed this in Sambandar’s dream as well, he received Lord’s gifts with reverence and worshipped them thanking the Lord for his concern and kindness, before making use of them. Riding the palanquin he visited ThiruArathurai and after worshipping there returned to Sirkazhi, visiting many shrines on the way, to the delight of his proud mother. When he was staying in Sirkazhi his parents performed the Upanayanam ceremony as he had attained seven years of age. At the time of the ceremony , Sambandar started reciting the Vedas and the Upavedas as well, after Brahmopadesam, much to the amazement of assembled priests who now they had their doubts in the scriptures cleared by him. Clearing their doubts he also spoke to them about the glory of Pantchatchara Mantra. During this period of his stay at Sirkazhi, Tirunavukkarasar came to see him and was addressed as Appar, a venerable epithet for father, which name he bore thereafter. Appar stayed with Sambandar for a few days and then continued his travels. Sambandar also left Sirkazhi, this time in pearl palanquin, to offer worship in various Shrines of Lord Siva. At Tiruppalasramam, the chieftain, Kolli Mazhavan by name, received Sambandar and took him to the temple. There he found a girl lying in the temple premises. On enquiry he learnt that she was the chieftain’s daughter who was suffering from epilepsy and that day as she was accompanying her father to receive Sambandar, she fainted with violent fits and the chieftain had come to receive Sambandar leaving her in the temple. Sambandar prayed for her cure and smeared sacred ash on her body, reciting a pathigam. She got up fully cured and fell at the feet of Sambandar, to the grateful delight of her father. He met Appar again at Tirupugalur and after staying there some time both left together on further journey. Sambandar wanted to walk in the company of Appar, but Appar dissuaded him saying it is only proper that he used the palanquin which was Lord’s gift for his use. So Sambandar following Appar, in palanquin, visited a few places, including Tiruvizhimalai and Tirumaraikadu, which have been referred to in the previous blog “Aartha Ananya Bhaktha – Appar”. While they were staying in Tirumaraikadu, emissaries from Pandya queen Mangayarkarasiar came to invite Sambandar to Madurai. Pandya king has embraced Jainism and was under the influence of Jain priests. As king himself had deserted Saivam, that faith was in decline. The queen and the minister Kulachirayar were still Saivites and they very much desired that Sambandar should come to Madurai and re-establish the glory of Saivam there. When Sambandar decided to go and conveyed his decision to Appar, he with a fatherly concern tried to dissuade Sambandar from clashing with Jains as he knew their ruthless and cruel side, from his personal experience and also as the time was not propitious. When all these arguments failed, Appar offered to go with him to Madurai. Sambandar thanking him for his concern requested him to proceed as per his earlier travel plans. Jains were not willing to give up and they suggested trial by fire. Sambandar agreed and wrote a pathigam on palm leaf and put it in the fire. Fire did not touch it and Sambandar took it out and gave it to king. Then the Jain priests dropped the palm leaf carrying their Mantras and it was quickly burnt to ashes. They then wanted trial by water as a last chance and submitted that if they lose again they will accept defeat and suggested they be impaled, if defeated. They all retired to the banks of Vaigai river. Jain priests first dropped their palm leaf carrying their Mantras, which was swept away out of sight. Sambandar wrote the hymn starting with “வாழ்க அந்தணர் வானவர் ஆனினம்” (Vaazha andanar vaanavar Aaninam i.e. Long live Vedic Bramins, Devas, cows) and dropped it in the rushing water. The palm leaf went up-stream and stopped at the banks near the king. The minister picked it up and handed it to the king, who had a bent back and was referred to as Koon Pandian. As the king read the words “வேந்தனும் ஓங்குக” (Vendhanum Onguha i.e. Let the king rise) his arched back straightened and thereafter he was referred to as Ninraseer Pandian. The king and queen fell at Sambandar’s feet and king came back to Saivam. Accepting defeat, the jain priests ascended the stakes, as per their words. After staying for some time as royal guest Sambandar left Madurai to return to Sirkazhi. The grateful king and queen accompanied his palanquin upto the border and there took leave of him. As he was travelling back to Sirkazhi visiting a few places on the way, he learnt Appar was at Thiruppoonthurithi, and travelled to meet him there. In the meantime Appar learning about his coming went unannounced and mingling with Sambandar’s entourage, put his shoulders to the pearl palanquin for some distance. After some time when Sambandar asked where is Appar, he replied that he is there blessed to shoulder his palanquin. Immmediately Sambandar jumped from the palanquin, fell at Appar's feet and remonstrated that he should not have done that . Appar pacified him saying that it is the minimum honour he could do to the blessed person who had taken the divine milk. They stayed there for some time telling each other about their travel adventures after the last meeting. Then Sambandar took leave of Appar and returned to Sirkazhi. After spending some time in Sirkazhi, Sambandar travelled north. Visiting shrines upto Kalahasthi, he returned via Mylapore. In Mylapore there lived a merchant by name Sivanesan. He was greatly devoted to Sambandar. He wanted to give his daughter, Poompavai, in marriage to Sambandar and bequeath his vast wealth to him. But she died of snake-bite. Greatly distressed but undeterred he preserved her ashes and bones in a brass pot for handing over to Sambandar, when he comes. When Sambandar came, he made elaborate arrangements to receive him and took him to the temple for worship. After the worship when Sambandar heard about his daughter, he asked Sivanesan to bring the pot to the outskirts of the temple. He prayed to Lord and sang a pathigam in which calling her by name he asked how can she leave the world without seeing the glorious festivals of Lord. As he was singing the pot broke and out rushed Poompavai as a twelve year old and along with her father prostrated before him. Sambandar asked Sivanesan to take his daughter home, declining the proposal of marriage with her saying she is like his daughter as she has now received life through him. He then proceeded to Sirkazhi. Sambandar was now sixteen and his parents arranged for his marriage as they wanted him to carry on with traditional Vedic rituals. As one who respected traditions, Sambandar went along with the ceremony that took place at Thirunallur. After the marriage ceremony, he went to the Nallur Perumanam temple with his wife and others and prayed to Lord for liberation from earthly ties. Then a Jyothi appeared in the temple and a voice rang out that all those who wanted to reach the Lord’s feet can enter the flame. Sambandar accompanied by his wife and other guests entered the flame to rest at Lord’s feet. In his short life of sixteen years Sambandar is supposed to have sung more than 10,000 hymns of which we have now available 4,147 only and they constitute the first three volumes of Panniru thirumurai. These hymns not only showcase his spiritual greatness, but also his language skills and music skills. He had not only used different ragas in his compositions, but had also employed different styles of composition like Mozhimatru, Thiruvirukkural, Thiruekapadam etc. 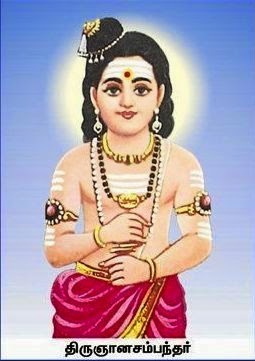 He was a divinely-blessed spiritual genius who stood steadfast in his devotion to Lord right from his childhood and hence is referred to as Jnani ananya bhaktha.